The driver stands tall and proud over any golfer’s bag. It is often the most expensive stick in the bunch and everyone loves to hit it. There has also been more innovation in driver design, materials, and manufacturing than among all other clubs. Some of those innovations later find themselves in other clubs. 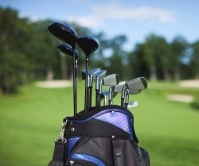 Multi-material construction used to be confined to drivers with stainless steel faces and composite crowns, but now you see multiple materials being used in irons with a stainless body, a polymer insert, and tungsten toe and heel weights in some models. The biggest trend in driver innovation continues to be with adjustability. It used to be limited to minor adjustments in loft, lie, and/or face angle, but now we increasingly see wider adjustments. It is getting more common now to buy a driver that is fully adjustable. Golfers don’t buy a 10-degree driver, for example, that has adjustability allowing a few degrees of tweaking in one direction or the other. Rather, manufacturers are putting out one driver model that doesn’t come in different lofts but is fully adjustable to any loft needed – from around 8.5 all the way up to 12.5 degrees for some. That certainly makes it easier on golfers and easier on retailers, shippers, and manufacturers too. Imagine how much easier it is to manage inventory. As these and other innovations continue to come out on the market, you owe it to yourself to visit a retailer, talk to your pro, or visit a demo day and see what the new drivers can do for you. 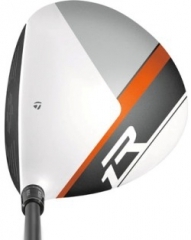 The TaylorMade R1 is one such fully adjustable driver. In fact, it might be the most adjustable driver on the market with five face angles and twelve loft/lie settings. With those settings, you can move between 7 standard and 5 upright lie options and dial up your own loft from 8-degrees to 12-degrees. Then, with an adjustment to the sole insert, you can further tweak how your driver sets up from two different open settings, two more closed settings, and one neutral or square setting. Finally, don’t for the shot-shaping movable weights in the club head. Based on how you set them up, the club can either perform with a draw or fade bias to match the conditions, your swing, or both. The club has the familiar glare resistant white finish, but with a new black, orange, and grey graphic across the crown. Ping has a couple of new drivers out this year in the Ping G25 and Ping Anser drivers. The G25 is the next in a long line of G-numbered models. This model has a larger face and a thinner crown than the G20, making it a hotter club and one that is easier to hit with the weight and material saved via the thin crown re-positioned to improve forgiveness. Two measures of forgiveness are Moment-of-Inertia (MOI) or the resistance to twisting and shot dispersion on off-center hits, and the Center of Gravity (CG) where lower is often better if you are looking for a club that is easy to launch the ball higher for more carry. Ping claims the G25 has the highest (most forgiving) MOI and lowest (again, most forgiving) CG of any driver they have ever made. 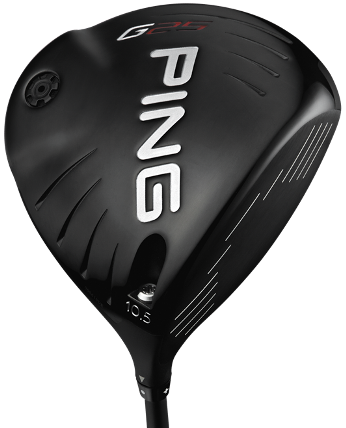 It also comes with Ping’s adjustable hosel that allows a ½ degree of adjustment either up or down to tweak your trajectory for given conditions. Ping’s Anser driver has the same adjustable hosel and is constructed of a titanium alloy that is very light and strong, allowing engineers to move weight around within the clubhead to optimize ball flight and launch the ball with low spin which, for faster swinging golfers, translates into more distance. It has a cool matte black finish and comes in the same loft options as the G25, ranging from an 8.5-degree version to 12-degrees. The Nike VR_S Covert driver is the latest from the folks that outfit the World’s number 1 and number 2 golfers and the first and only truly “cavity back” driver. By that I mean they have literally cut a section out of the back center of the clubhead to move weight to the toe and heel and improve overall MOI. The Covert is another driver that you won’t have to hunt the display stand to find the loft you want. It is fully adjustable from 8.5 degrees to 12.5 degrees and the hosel allows each loft setting to be coupled with one of three face angles. 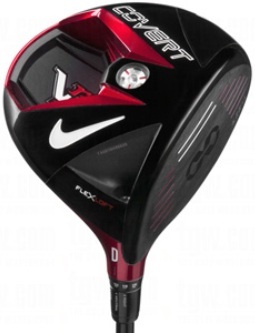 The club also features what Nike calls NexCOR Face Technology to maximize Coefficient of Restitution (COR), which is literally how hot or springy the face is. They claim the technology creates a 45 % larger hot zone using varying thickness across the face to position that hot zone where most golfers tend to make contact. Most of us are more likely to miss the ball somewhere low near the heel and higher on the center of the face, so that is where you’ll get more distance on mis-hits with this club. Plus, it comes in a cool red finish that is unmistakable on TV in the hands of the top pros. The Cobra AMP Cell driver has a lot more to offer than your choice of paint job. While it does come in your choice of orange, blue, red or silver, it also comes with full adjustability. Again, this is another driver that can be adjusted to one of six settings from 8.5 degrees of loft up to 11.5 degrees, with two of those settings a draw biased 9.5 degrees and 10.5 degrees. The sole of the club has something they call their SmartPad technology to ensure a square face at address regardless of the loft setting with no additional adjustment required. There is an AMP CELL Pro model as well that features a smaller head at 440cc and incorporates all the same features. 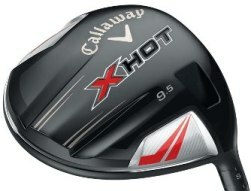 Callaway also has a pair of new drivers this year in the Callaway X Hot driver and the Callaway RAZR Fit Xtreme. The former, X Hot, is a cast club with what they call their thinnest casting ever. The ability to cast a thin club gives them more ability to move the weight saved through that process to other parts of the clubhead, increasing overall forgiveness. They also incorporated a new Speed Frame face – a design to create more speed across more of the face while reducing sidespin (that means the ball flies straighter). This technology is what is in the famous “Phrankenwood” driver that Mickelson has been using with a 3-wood clubhead. Like the X Hot, the RAZR Fit Xtreme has a three way adjustable hosel to change the face angle from open, closed, or neutral. The RAZR Fit Xtreme is a mulit-material driver though with a composite crown on a stainless body and face. It also has a pair of weights in the heel and toe. Moving the 13-gram and 1-gram weights allows golfers to create a draw bias or maintain a neutral configuration. And that’s not all the options out there. Some other great options are available from folks like Adams, Cleveland, Titleist and more. All have great innovations and great new technology that might be a good fit for you. The best way to find out is to work with a clubfitter to get some expert advice and help to find a new driver to stand tall and proud over your bag. In the northeast corner of Independence is a touch of the Ozarks sitting above an active limestone mine. 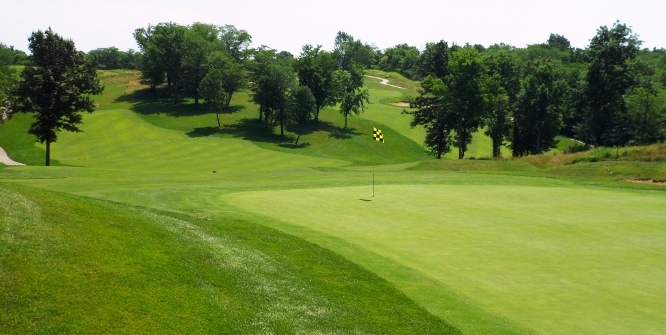 Opened in 2003 by mining owner Harlan Limpus and designed by the Craig Schreiner, WinterStone Golf Course offers an up-and-down layout balanced with challenges for advanced regulars and fairness for average duffers. According to the course’s historical record, Limpus bought the 150-acre plot and started operating a mine in 2000, then added the golf course because the topography was ideal and to enhance surrounding property values. 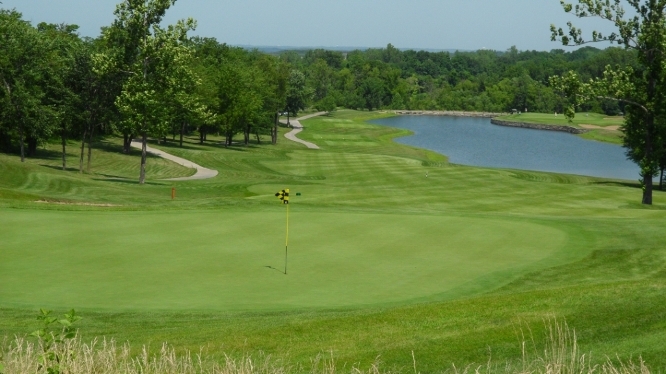 The par-72 layout plays 6,752 yards from the gold tees and 4,976 from the blues. Pearson’s first big project, however, was to re-grow the greens on Nos. 1-4 and 9, as well as the practice green, after a mishap late last summer killed the grass. They’re in commendable shape now given the super-wet spring. “Within a few weeks of some warmer weather they will be fine,” Pearson said. 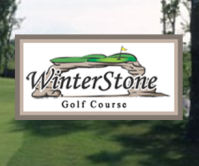 Players can get a good sense of WinterStone and its elevation changes right away, with the first hole gradually sloping toward an elevated green and the par-3 second dropping straight down from the tee box. Players might need the turn for a mental break, as the par-5 ninth features water hugging the fairway and green on the left and bunkers dotting the right side and the fairway. The par-4 No. 10 tee overlooks another pond that requires 216 from the gold tees to carry, with a tree line separating the fairway from East Kentucky Road. Chapman said the 10th tends to be most intimidating hole for players. “If it’s a true prevailing wind, it’s a crosswind (left to right),” he said. “It is a hole that visually really messes with you. No. 11, there’s a creek and the fairway is slightly elevated. That could be an even tougher tee shot. Back-to-back par 4s provide a solid finish. The 17th is short enough to entice big hitters to reach the green off the tee, if they want to risk the rock-wall creek crossing in front of the slightly elevated green, while 18 hugs the pond along the left side and has a healthy-sized bunker ready to swallow approach shots off to the right. Chapman said while WinterStone doesn’t measure especially long, the elevation changes can add distance for certain shots and force players to use a variety of clubs. 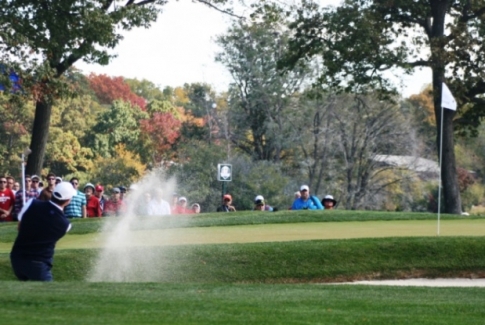 One of the most daunting shots in golf is the bunker shot. For many of us, just getting out with out chunking it and leaving it in the bunker or, just as bad, skulling it across the green and potentially into worse trouble. If you watch the pros on TV, though, you will see that they aren’t merely trying to get out, they are usually trying to get it close. That’s because they know the technique that makes the shot predictable and fairly easy to execute. Then, with practice time, they all get very adept at bunker play. Follow these steps and get in some bunker practice and you’ll find yourself less worried about getting out and more aggressively hitting this shot to get it close. 1. The first thing that you want to do is get a good solid stance when you have to hit out of the bunker. We want to dig our feet down about an inch or two. When you do this it will keep our feet from sliding around when we are swing the club. 3. With those two steps, we have our basic setup and are ready to make the swing. I think the most important part here is to keep the lower body quiet with as little movement as possible. A quiet lower body helps us make good quality swing to get the ball out of the bunker. 4. 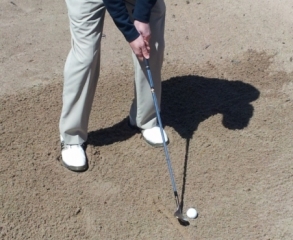 As you make your downswing, make sure that you strike the sand first and not the ball. 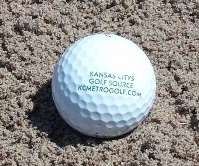 By this, I mean to first make contact with the sand behind the ball. This will let the sand lift the ball out of the bunker so it comes down soft on the green. I tell all of my students when you are practicing to draw a line about two inches behind the ball and hit the line and not the ball. This will help you to strike the sand, not the ball. In the picture at right, you can see how the golfer has done all the things I mentioned so far: His feet are dug in slightly, he has gripped down, and he has a line drawn behind the ball to give him a point to strike with the club. 5. A final word on the swing, and one I must make because it is something I see a lot of people do incorrectly. Golfers must keep the speed of the swing or accelerate the clubhead throughout the strike. If you don’t do this, the club will stick into the sand stopping your follow through and, usually, leaving the ball in the bunker. A good image to remember to do this is to try to throw the sand onto the green. This will ensure you are not slowing down your swing during the shot and the ball will get out of the bunker and on the green. Notice in the photo how our golfer has thrown sand into the air during his shot. You can bet he accelerated through the shot to get to that finish. A great example of this is seen in the shot below of Paul Lawrie at last year’s Ryder Cup taken by KC Golfer Magazine photographer Tim Carrigan. See how Paul has accelerated through the sand to his follow through, taking plenty of sand and throwing it at the green. If I recall, this shot finished within tap-in distance, allowing him to halve the hole with Brandt Snedeker before eventually winning his single match to add another point to the winning Euros’ tally. If you practice these steps you will see that your green-side bunker play will improve. It will take attention to your setup and practice to get the feel for the shot and the feel for different types of sand. Give it a shot and if you are still having trouble, come see me at Deer Creek Golf Club. About the Pro: Jason Rudolph started playing golf at age seven with his grandfather. Golf has always been a great family activity for Jason and his son even received his first set of golf clubs on his first birthday. Jason attended the San Diego Golf Academy where he learned golf course management and the basic principles of teaching. Over the last five years Jason has been teaching golf at Torrey Pines Golf Course in San Diego, CA. His clients have ranged from juniors to adults. This includes from beginners all the way to Tour Players. While working at Torrey Pines, Jason worked with the USGA during the 2008 U.S. Open and the PGA Tour during the Buick Invitational and the Farmers Insurance Open. In addition to teaching golf, Jason has competed in PGA Tour qualifying events and the Golden State Tour in Southern California. Prior to beginning his career in the golf industry, Jason served in the United States Army in Desert Storm. The world rankings underwent a shakeup in the top 10 after Australian Adam Scott beat out Argentina’s Angel Cabrera in a playoff duel at the Masters Tournament. Both had finished -9 to par in an extremely competitive field. On April 14, the 32-year-old Scott finally won his first major championship by holing a 20-foot birdie on the 18th hole of regulation and downing a 12-footer for birdie on the second extra hole. The Australian’s victory earned him a $1.44 million purse with Cabrera bagging $864,000. Scott had came close at the 2012 Open Championship. His bogeys on the last four holes left him one stroke shy of Ernie Els. 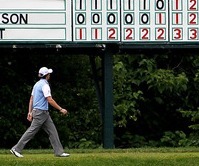 At this year’s Masters, fellow Australian Jason Day came in third (-7). Tiger Woods and Australian Marc Leishman tied for fourth (-5) while Sergio Garcia, Lee Westwood, and Matt Kuchar tied for eighth place (-3). McIlroy tied for 25th (+2). Tiger Woods may not have won this year’s Masters but he has clearly regained his old dominant form by winning six tournaments in the past calendar year. 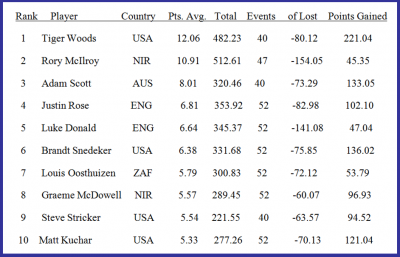 In terms of the World Golf rankings leaderboard, Tiger Woods regained his No. 1 ranking in March after a two-stroke win at the Arnold Palmer Invitational in Orlando. In that tournament, Justin Rose came in second to take home $669,600 and improve the Englishman’s status as the third-ranked player in the world right behind Ireland’s Rory McIlroy. 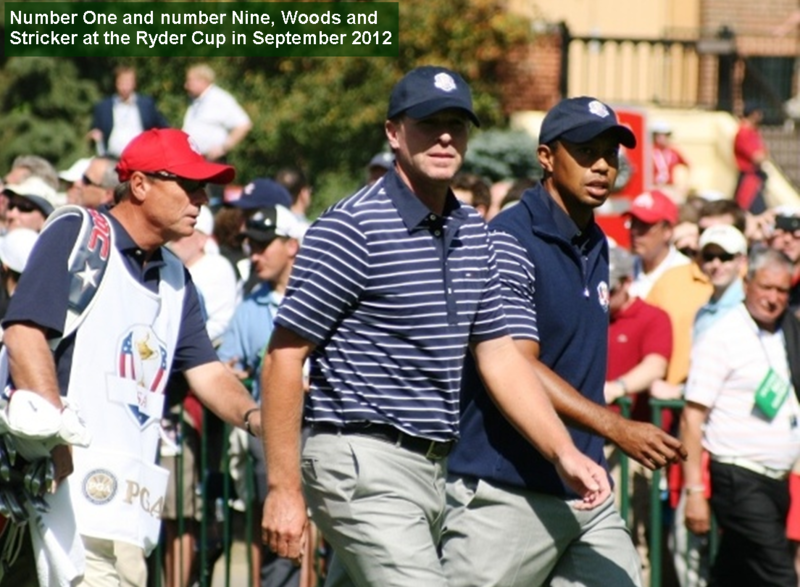 Woods, who took home $1.1 million for winning the PGA Tour event, had abdicated the top spot since October 2010. The sport’s most popular player had battled various leg injuries and a high-profile divorce over the past two years. Woods had fallen to No. 58 in November 2011. The 37-year-old regained his focus and holed three eagles to win Palmer’s tournament for a record-tying eighth time. Nike immediately launched an ad campaign which proclaimed “winning takes care of everything”. Tiger Woods reclaiming his throne at the No. 1 spot will add to his record number of weeks perched at the apex of golf. By mid-April, Woods will have spent 626 weeks in the top position. Greg Norman spent 331 weeks as the top-ranked golfer. 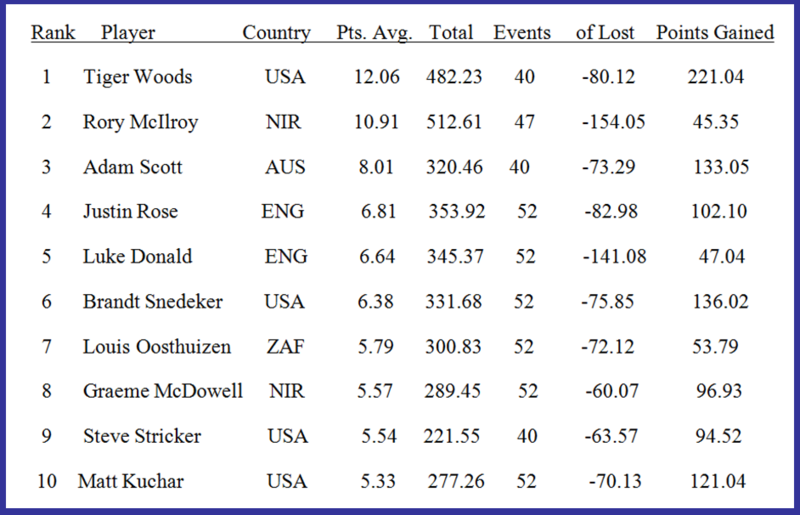 However, 23-year-old phenom Rory McIlroy fell further behind Woods (in terms of points) in the rankings leaderboard (as of April 22) due to the Irishman’s recent struggles in his game. Prior to the Masters Tournament, McIlroy had inched to just 0.63 points of tying Tiger Woods for the top spot. 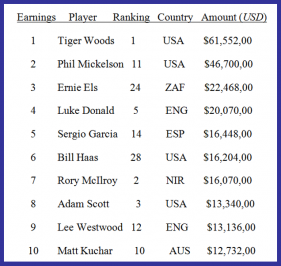 Forbes ranked Tiger Woods as the highest-earning golfer in the world at $61.2 million during 2012, with Phil Mickelson coming in at second with $46.7 million. 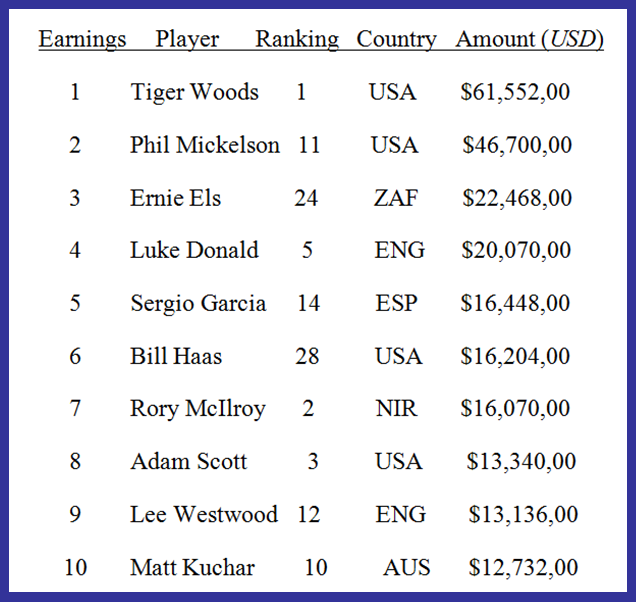 After claiming a $1.44 million purse for topping this year’s Masters, Adam Scott is poised to remain a top 10 earner for 2013 if he maintains a focused game for the rest of the year.